You may not know this, but I was a bit of an uneducated moron about cancer before my diagnosis. I lived a healthy lifestyle – probably above the average of any normal twenty-something. So my attitude was definitely of the sort “it’ll never happen to me”. That’s one of the reasons I decided to blog about my cancer. As sick as you may be of hearing me go on about my life with cancer, it may be useful to one person. Hey, you’re reading this, so you must have some interest in me! So that’s all I care about, sharing my life story so that one person doesn’t need to feel so alone. If it can help prevent someone else needing to go through what I have, too, then great! As you may have noticed, my cancer story has had a little more exposure these past few weeks. With my article released on Glamour Online, my cancer patient video for Stand Up to Cancer with YouTube Fights Back and local papers, along with my interview on BBC Oxford Radio about my Beauty Bus venture it has all been a bit chaotic! It is all for the better though, and I haven’t done anything that I haven’t agreed with. With cancer, I have come to realise that few people actually care about it unless it has had a direct impact on them. A harsh statement you may think; reading this you may be of the minority where this isn’t true, but most people don’t care about cancer if they don’t see it. Now maybe this is protection, intentional – as a self-preservation kind of thing, or natural – as an unintentional development as humans, but generally, people go about their everyday lives not really thinking of the impact such a devastation has on a person’s life. Hell, I have no problem with this! I used to be this very person! I didn’t really care about cancer, it didn’t affect me personally, so why should I care? I’d give to charity, I wasn’t completely heartless and I wasn’t rude towards it. I would give my £2/£3 for a slice of cake because I felt obligated to, sponsor a runner £5/£10 again because I felt I should but that’s as far as it would go. I’d be sad if I saw a kids story with cancer, that one I don’t think I’ll ever understand why they ever need to go through it… but by the change of a topic, they were forgotten. I expected this with my cancer story, to blend into the background. 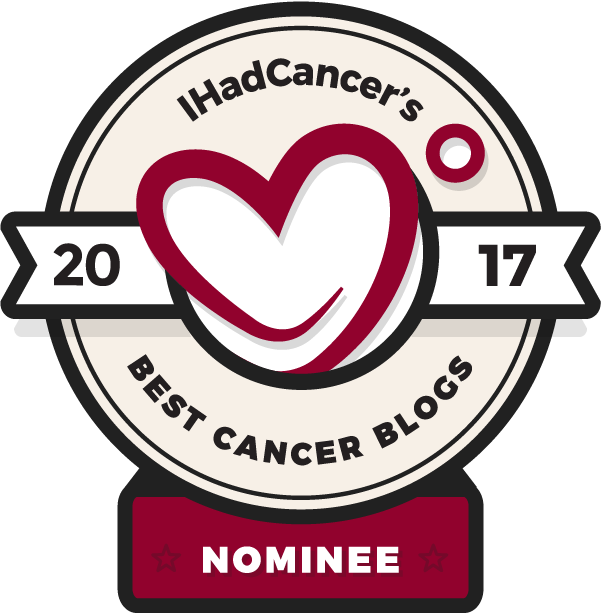 My blog is just a drop in the ocean when it comes to others and their experience with cancer and I’m OK with that. As far as I’m concerned there is more than enough space for everyone to share their knowledge about it. I know how important it is to share it, not just to you the reader, but for the writer too. It is very cathartic letting it all go. So yes, I will carry on talking about my cancer story because although some may not care about cancer, I still need to talk. There is one thing that is hard to do, I have always been this way. It is hard to offend me. Some people have been cautious when asking me questions about my cancer. This is mostly through fear of me being offended by it being too much of a personal or intimate question. I have no limits though. If there is a question about my cancer that you want to know then I will answer it. It is through education that we learn and by now, we should be comfortable about talking about this subject. That’s just me, however, it doesn’t mean everyone is this way. I have recently found myself in a couple of situations where people have been extremely insensitive. These people are probably unaware of their actions. They are pretty minor in the grand scheme of things but pretty major when put into perspective. They are general passing comments that you take on the chin, to begin with, and you don’t really think much of it but eventually, it sits and festers. I’m pretty robust when it comes to things like this but occasionally they can set me off course. Even now thinking about it I can find myself in a heap on the floor crying over it. It is not through malice that they have caused this offence but through uneducation. It is something that I am trying to work on myself. You may wonder why, but the first occasion I just took it, I didn’t have the quick wit to pull them up on it. 24 hours later the damage had been done, that’s all I could think about. One person’s action took the attention away from a magnificent achievement. One person may not do a lot of damage. However, you group together each one person of uneducation and that can do a significant amount of damage. My second encounter with moronic uneducation, I did better. Yes, the comment may have crumbled me but I am proud of the fact I stood up for myself. No aggression is needed to put across my point but an assumption is not necessary when my whole life is basically on the web. Through a few clicks, all the information needed is at your hands. I dread to think if I was ever this person… I don’t think I was, however, can you ever really be sure? Although I may have been an uneducated moron, it was more through a limitation of exposure to cancer rather than an ignorance to it. It’s OK to be uneducated through limited exposure, that’s why I’m doing this. I’d rather it be that way! However, ignorance in the sense of it being rude is unacceptable.